Questions you may have about shopping and customer care. 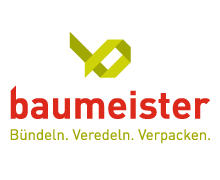 Who is the company Erich Baumeister GmbH? As a family business founded in 1964 by Erich and Renate Baumeister, we combine traditional values, such as reliability and continuity, with innovative strength. We are your partner for professional bundling, finishing and strapping . Can I buy from you as a private customer? We offer a range of products at private customer under www.dekopack.de. We offer our products at business customers under www.erichbaumeister.com. Can I collect my orders directly from your store myself? After consultation you can collect your orders at our company. How much is the minimum order value? The minimum order value is 17,85 EURO VAT included, plus transportation charges. Who builds your machinery ADT? We are manufacturer of the ADT-Tyer and the GRB-Bancher. We carry out services, adjustments and repairs in our workhop. On request we can provide you an on site service. Into which countries does the company Erich Baumeister GmbH deliver? Currently we deliver to over 35 countries around the word, not all countries are activated for our shop. If you have any need, do not hesitate to contact us. We daily deliver from Monday to Friday. We ship the parcels by DHL-parcel. We send pallets for example by the forwarding companies HTI and Logistik GmbH, Münster and Koch International/CargoLine. Do you also deliver by express shipping? Express shipping will be made by TNT Express GmbH.